A lawyer by training, before joining Interel, she worked at the Law and International Treaties Department at the Ministry of Foreign Affairs of Lithuania. She also gained extensive experience at various levels of government having worked in the European Commission, the European Court of Human Rights, the Embassy of France in Lithuania – UBIFRANCE Economic Mission – and the European Law Department under the Ministry of Justice of Lithuania. 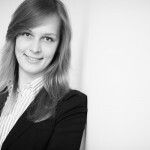 She started her career at the leading law firm in Vilnius. Migle participates in the activities of the Lithuanian Lawyers Association in Brussels, and currently holds the position of President, as well as coordinates in Benelux region the global voluntary professional mentoring programme for Lithuanian students around the world. In addition to her native Lithuanian, Miglė is fluent in French and English, and has basic knowledge of Spanish and Russian. She graduated in Law at University of Strasbourg in France and holds a Master’s Degree in European Union Law and a Master’s Degree in Business Law.